Locations: Shore Line Jct., Air Line Jct., Devon, Maybrook, Campbell Hall, Burr Road, more..
New Haven Railroad, as filmed by Tom Donahue. Beginning with a small amount of black & white film from the 1940’s, we see many years of action on New Haven. Mr. Donahue was a New Haven employee. He had employee access for some, in the tower views. For the most part, this program features the electrified Boston- New York Shore Line. As noted in the film, there were no sound recordings at time of filming. No dubbing has been used. Instead, some background music with narration. There are no maps. Every location is noted. The rate at which the show progresses, maps may have proved to be a distraction. The pacing moves quickly from scene to scene. Still, I prefer some geographic orientation. The narrator has a very clear speaking voice. He is direct and to the point. He will call out many of the locomotive types that are seen. We will need that information. Viewing New Haven’s power of: steam, diesel and electric can be challenging. They had a very diverse roster of motive power. Many rare locomotives are to be witnessed. The earlier years had many Alco and some Fairbanks Morse, along with Electromotive. Electrics had some big engines. Let us not forget the RDC trains. Composition is amateur level, as noted below. Right trains and era. Just not pro shot. There is a major difference between the 16mm New Haven in the 1950’s, and this 8mm sourced show. As the 16mm film has higher quality, it is much clearer to watch. The camerawork on this release is not as fine as, The NH in the 1950’s show. Angles get too sharp, foregrounds too large, poles and such in the front. Historical value is there, but amateur shot footage overall. The Shore Line Main starts in 1953 with rare Alco DL109 locomotives in color! Alco PA-1 with passenger consists in the green and gold scheme. Some name trains are identified. The Senator being a main one. The Yankee Clipper is another. Alco FA ABBA set leads a freight train. FM C-Liners are viewed. Alco S-1 pulls some iced reefers. The short segment on, the upper quadrant semaphore signals was great. There are plenty of electric locomotives. The EP-5 is probably the most well known and looks excellent in the McGinnis paint scheme. Also, EF-1, EF-3, EP2, EP3, EP 4 and more. Green and gold rules on these models. Very little McGinnis livery is present. Maybrook Steam & Diesels begins in 1951. Lehigh New England FA’s make a grand entrance to open the chapter, at Campbell Hall. New York Central and Erie also appear there. Even more action at this varied location. The big surprise here, New York Ontario & Western FT units, in color! More NYO&W, this time with chicken wire F units. Throw-in an A-B set of FT’s on a freight How rare is that to see? Let’s have fun…. At Maybrook, a large locomotive approaches… what railroad? Two crewmen in the cab of Lehigh & Hudson River #11 look at Tom…..Priceless!! Return to black & white film, with steam: Lehigh & Hudson River plus New Haven at the Maybrook yard. Additional NYO&W diesels, plus Erie steam. .
All color is back now. It’s all New Haven at Fairgrounds, Berkshire Jct., Maybrook Route. This must be getting into the 1960’s here. Bigger locos and more McGinnis paint jobs. A U25B with the one piece windshield and later split windshield, confirms the timeframe. Riding the train leaves South Norwalk and travels to New York. The camera faces rearward. The image shakes too much, maybe rough roadbed. Lively narration contains much history and current day changes. This is an entertaining look at New Haven. A well written script carries this show well. Credit to New Haven Railroad & Technical Association for script and research. At times the narrator sounds like a tour guide. Between the two Greg Scholl programs. The New Haven in the 1950’s, is the superior show. This one is best for those railfans who want more of this rarely filmed railroad. 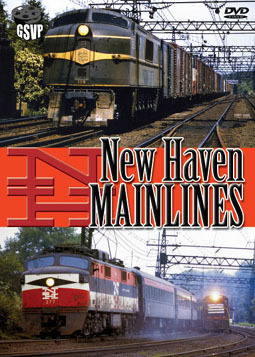 New Haven Mainlines is a look at the Green and Gold livery era. A long gone fallen flag. This entry was posted in ATVR Reviews, Greg Scholl and tagged American Train Video Reviews, electric, Railroad, Train DVD by William J. Hudson. Bookmark the permalink.